You now have the ability to delete a team project from TF Service using the web UI rather than the command line (the command line still works, and you can find the instructions here if you need them). Unfortunately, this only applies to the service. In the future, we plan to have both team project creation and deletion be available from the web UI for the on-premises server, but we haven’t gotten to it yet. However, it’s a bit hidden. Here’s how to find it. First, go to the project home page for one of your team projects (you’ll need to be an account admin) and click on the gear icon in the upper right. It doesn’t matter at this point which team project you pick. Doing this will open a new tab with the administrative web page in it. Next, click on DefaultCollection in the navigation area in the upper left. Doing this will take you to a list of team projects. 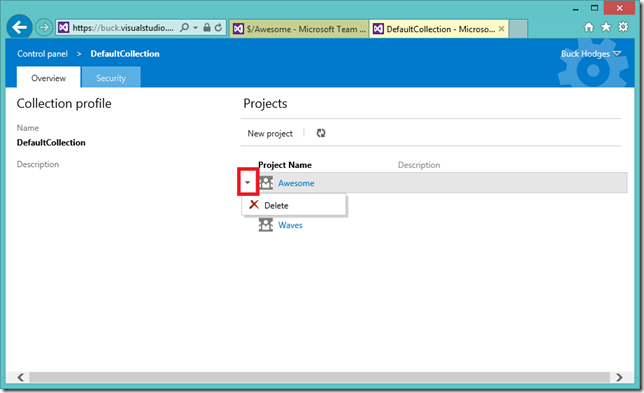 In the list of team projects, you will see a drop down arrow to the left of a team project name when you hover over the name with you mouse. Clicking on that drop down arrow will give you the option to delete the team project. 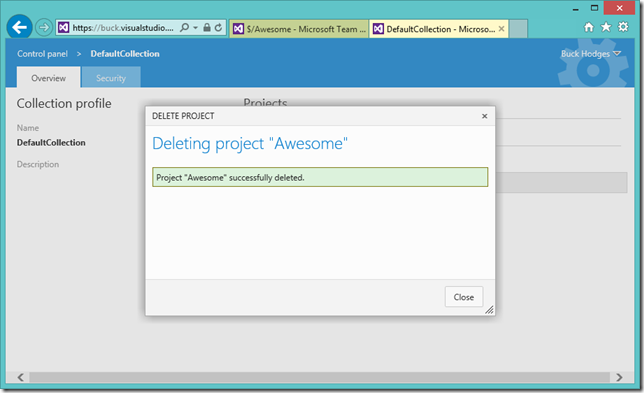 Here I am deleting a team project called Awesome. 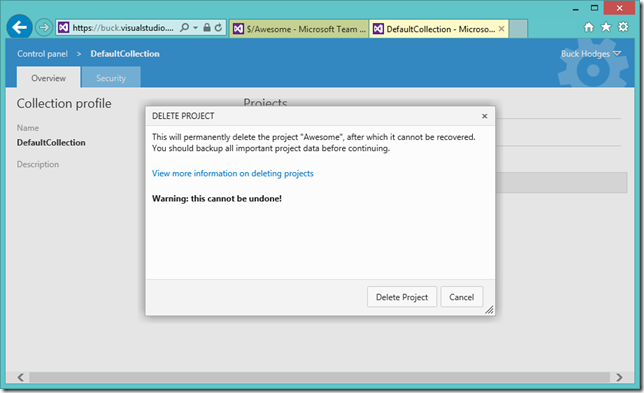 Now you will be presented with a dialog to confirm deletion of the team project. Be sure you really want to delete the entire team project. The code, work items, etc. will all be destroyed on the server. There is no way to recover from this operation (it’s not a soft delete at this point – it’s in our plans for the future). So, be certain you want to delete the team project (and double check that the name in the dialog is the one you want to delete)! If you choose to delete the team project, you will see a progress bar. The time to delete a project depends on how large it is. For an empty team project, it will be done in seconds. That’s all there is to it. Just be careful that you don’t delete something you care about!